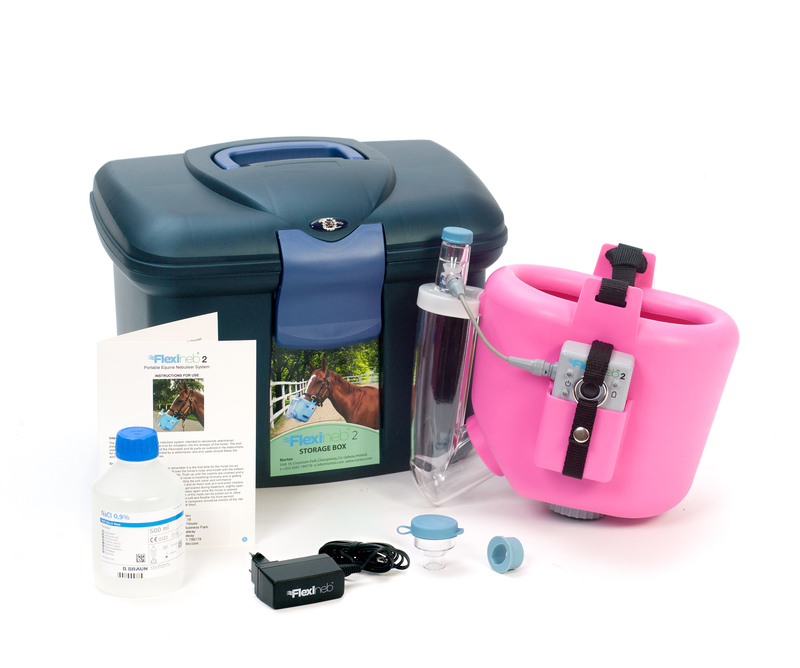 The Flexineb is a way of delivering inhaled medication to horses with respiratory problems. It can be purchased either for use just with inhalers (MDI) or as a complete system with a nebuliser & that can also be used with inhalers. It comes in 3 different sizes. You can also get your inhalers from eVet - just give us a call today on 01344 283888. As these items are human medications they cannot be displayed on the website and they require a written prescription from your vet. The Flexineb is the optimum way of giving inhaled medications, as it directs concentrated amounts of medications to the airways & lungs. 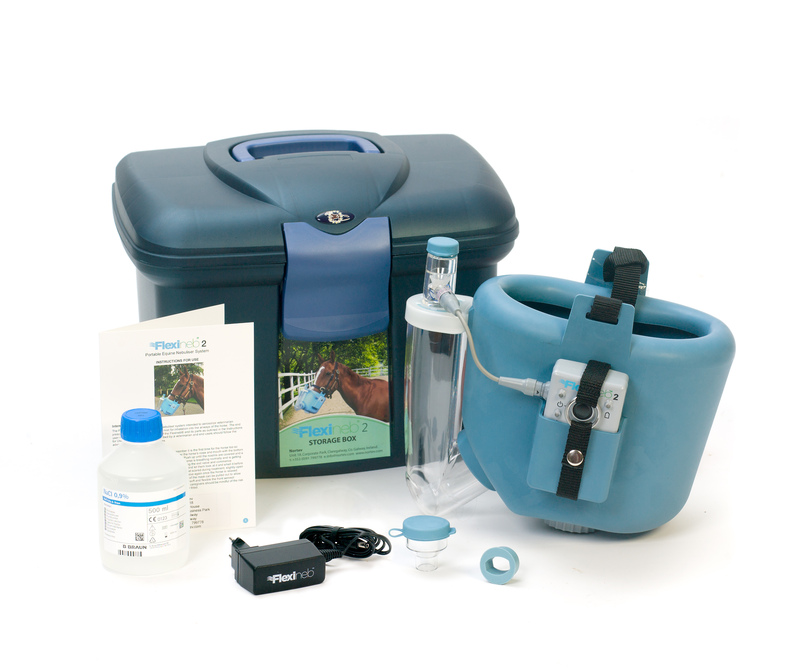 The Flexineb is silent, meaning it is suitable for spooky or more nervous horses & ponies. The Flexineb comes with a full instruction manual on how to use it. If just the MDI (metered dose inhaler) version is purchased, the Flexineb Upgrade Kit can still be purchased at a later date, which will mean that it can also act as a nebuliser. The nebuliser is very efficient, as 10mls of liquid is nebulised in approximately 12 minutes. The nebuliser battery gives upto 3 hours of use on just a single charge. Flexinebs come with a 2 year warranty on manufacturing defects (excluding medication cups) & a 6 month warranty on the battery. Please note that medication cups need to be replaced after approximately 200 usages (replacement cups are sold separately). An exciting new product that can be used with your Flexineb without prescription, is Equisilver (sold separately). It contains chelated silver & is a really useful product for horses with respiratory infections or allergies. Sizing & Colours Measure the diameter of your horse or pony's muzzle just above the nostrils. Foal/pony system- Suitable for 30-43cm muzzle diameter. Available in Blue only. Thoroughbred system- Suitable for 44-51cm muzzle diameter. Available in Pink or Blue. Warmblood system- Suitable for 52-66cm muzzle diameter. Available in Pink or Blue. Balsamic Air is a liquid nutritional supplement for respiratory support, it can be given by mouth, or nebulised, for example with a Flexineb. Balsamic Control is a nutritional supplement for use in young horses prone to respiratory issues or for horses living in a dusty environment. Equistro Respadril is an effective respiratory supplement, formulated to be given as a 5-7 day course to aid your horse's natural immune response to respiratory disease or allergies. Please be aware, this product is no longer safe to use if competing under FEI rules. Cavalor Bronchix Pure All in One is a 100% natural supplement, formulated to soothe your horse's respiratory tract. It contains a blend of 20 specially selected herbs, including Chamomile & Juniper.